The Big Shot. Need I say more? As you can see, I have used mine a ton if the glass plate is any indication. I use the Big Shot on almost every card I make. Staz-on Ink. I used to use just plain-Jane black ink for my stamped images that I was going to color in… then I found Staz-on. Oh my. There is no going back. The image is much crisper and smooth–similar to something you would print out on a printer. The downside is that it takes a few extra minutes to dry… but, its worth it! Fiskars’ Paper Cutter. I know there are probably newer ones out there. But, this is my standby. As long as I can get blades for it, I am going to use it. I like it because of the grid lines being dark and span the entire length. I also like the flip out extension arm for 12 x 12″ paper. I did, however cut off the pesky guide wire where the blade is. I ended up accidentally cutting it with the blade. Tattered Angels Glimmer Mist. Oh. My. Goodness. I firmly believe everything is better with sprinkles… and that everything is better with glitter. (Shout out to Yia-Yia who agrees!) I have had this bottle FOREVER. But, I hit almost every card with glitter before I am done. It delivers a nice even “mist” of glitter–nothing harsh or obnoxious. I do suggest starting to spray BEFORE you “pass by” the card or paper and then continue off the paper. Otherwise, you will get droplets of mist. Handmade Stamp. I didn’t know you could do this. I have had rubber stamps made before for my notary license, but never thought to have one made for cardmaking. I was so tired of the cheesy “created by” stamp and then I had to hand write my name in the space. So, I had one made online. With shipping… it was $8.00. No kidding. Creative Memories’ Multi-purpose tool. I am sure there are other brands that make this tool. Buy what you can afford. This was actually one of my first purchases when I started scrapbooking. I love to use the long end to pick up and line up lettering and stickers and other embelishments. 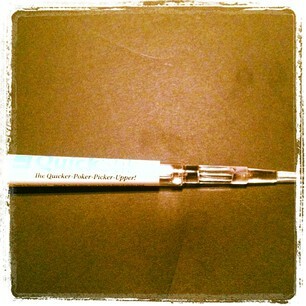 I use the pointy end to poke out the centers of letters or to hold down small pieces until they are set in glue. Precision Scissors. This particular pair is from Stampin’ Up. But, any good pair will work. I love the weight and feel of them and use them almost constantly for smaller details. They are wonderful for cutting off “strays” after you use a die cutter or punch. Just make sure you only use them for paper crafts… AND… these are super sharp, so store them away from kids’ grabby hands. 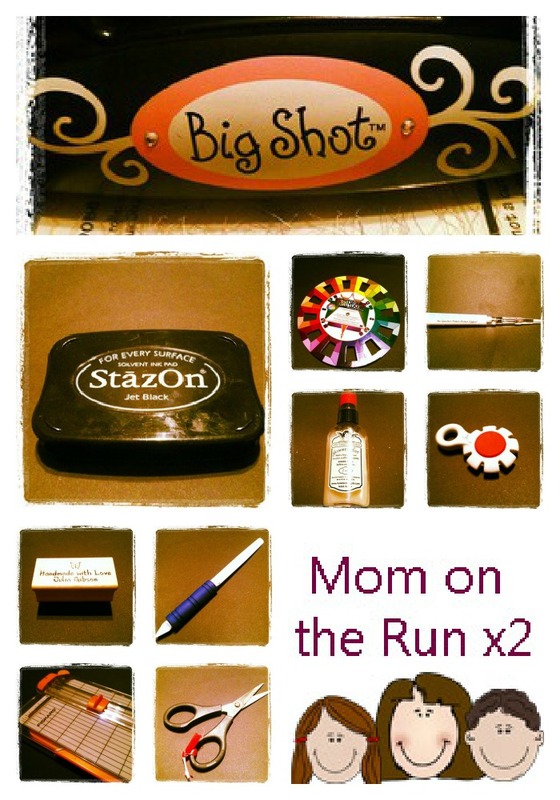 Tim Holtz Distresser. I just recently purchased this and I am not sure why I have never bought one before. See the little blades in the spaces? You drag those blades across your paper edges and it distresses them… MUCH better than tearing or with sand paper or a “heart attack.” Love this little thing. I used it on a couple of my cards for the fair. It makes the distressing much neater and more professional looking and is very easy to use. Artist’s Color Wheel. I purchased this online from Amazon.com. I had never had one before and just best-guessed when I needed to find coordinating paper. This thing is amazing. It will help you find complimentary and coordinating colors, as well as find accents colors that you might overlook or think wouldn’t look good. Amazing. You need one. This one only cost a few bucks. I was introduced to this little doo-hickey at a card making class I took at Archiver’s. I was unable to get a very good picture of it. It’s called a Quick Stik. I’ve seen them at Michaels, Hobby Lobby, etc. The end in the picture can be used to “conquer and divide” gems and rhinestones from the paper and then be used to place them with ease. The other end (not pictured) has a itty bitty glue stick for when those stupid sticky gems just won’t stick. Super awesome. So, these are my faves…. what are your faves?